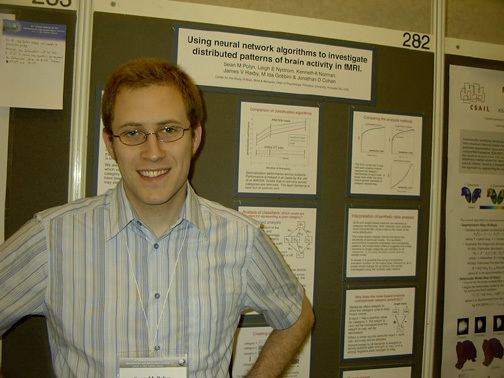 Above: A delightfully old picture of the author giving a poster presentation in Budapest at the Human Brain Mapping conference, Summer 2004. As should be apparent from the gleam in the author's eye, this is before he spent 6 hours explaining the material again and again to attendees with widely varying degrees of interest. For a full list of publications, please refer to the Vanderbilt Computational Memory Lab's publications page. Norming materials - Task word pool (TGZ). The task word pool contains 1297 words; each of these words has been judged by 12 subjects using three tasks: Pleasantness, Size, and Animacy. The statistics regarding these judgments are included, along with a technical report describing the details of the norming experiment. Detection of retrieved memories: A major component of my PhD work was a neuroimaging study of human memory. A quick summary: We measured people's brain activity while they studied a number of things, as well as when they later tried to remember those things. We were able to tell what type of thing they were trying to remember, often several seconds before the person started reporting specific items! This work was published in Science Magazine in the 23 December 2005 issue ("Category-specific cortical activity precedes retrieval during memory search"). See above for a link to the article. Connectionist model of human memory: As one part of my PhD work, I developed a connectionist model of prefrontal and medial temporal interactions; the model is an attempt to describe the memory search process that occurs during episodic memory tasks such as free recall. The model is a modification of one described by Ken Norman & Randy O'Reilly in an article in Psychological Review (2003). My modifications are inspired by Mark Howard & Mike Kahana's model of Temporal Context Memory. The gist of the theory: Humans maintain a pattern of activity in their brain that generally reflects the details of what has been going on recently (also known as "spatiotemporal context" or just temporal context). Whenever a new memory is stored, it includes within it this temporal context pattern. That means when the memory is retrieved, the temporal context pattern is retrieved as well. Coming soon: A pictorial tour of the model. For more detail, consult my dissertation, linked above. Classification of distributed patterns in neuroimaging data: The rest of my time is spent caressing fMRI data acquired with the 3T Siemens magnet located in Green Hall at Princeton University (and maintained by the Center for the Study of Brain, Mind, and Behavior). The memory study described above used these techniques. Detection of categorical representations: This work was most recently presented at the Human Brain Mapping conference in Budapest, Summer 2004. In collaboration with Jim Haxby, Ida Gobbini, Ken Norman, Jon Cohen, Youssef Ezzyat & Leigh Nystrom. Subjects in the scanner view pictures of stimuli drawn from a number of categories: male faces, female faces, monkey faces, dog faces, houses, shoes and chairs. Using neural network classifiers (backpropagation), we are able to identify the category of stimulus being viewed with near ceiling accuracy.